This post was written by Samuel Scott, an Associate Research Fellow and Suman Chakrabarti, a Senior Research Analyst in IFPRI's Poverty, Health, and Nutrition Division, based in the IFPRI South Asia Region office in New Delhi. One in two pregnant women in India are anemic. This condition of low blood hemoglobin, the protein in blood that delivers oxygen to tissues, is one of the most pervasive and persistent public health issues in India. Anemia during pregnancy is particularly worrisome, as it affects both the mother and the developing child. Negative outcomes associated with anemia during this critical period include maternal mortality, risk of infection, preterm delivery and poor fetal and infant health. In our new research article in Public Health Nutrition, we — along with co-authors from IFPRI, the Public Health Foundation of India and Oxford Policy Management — identified sociodemographic, programmatic and dietary drivers of anemia reduction in pregnant Indian women over 10. 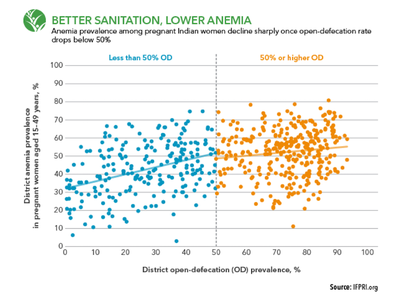 Among our findings: Lower rates of open defecation were correlated with lower anemia rates (see chart). This suggests that current efforts to eliminate open defecation in India may have the benefit of parallel reductions in anemia. Using two rounds of District Level Household and Facility surveys (2002-04 and 2012-13) and two rounds of Household Consumer Expenditure Surveys (2004-05 and 2011-12), we also found that after the decline in open defecation, the strongest contributors to anemia reduction were older age at pregnancy and increased dietary consumption of iron and folic acid. These findings suggest some avenues for addressing one of India’s major public health problems. Along with other South Asian countries, India is not currently on track to meet the World Health Assembly target of a 50 percent reduction in anemia among women of reproductive age between 2012 and 2025. In the last 10 years, anemia has declined by 2 percentage points in non-pregnant women (from 55 to 53 percent) and by 8 points in pregnant women (from 58 to 50 percent) according to the third and fourth rounds of the National Family Health Survey. This translates to a 0.2-0.8 point annual decline, far below the necessary 2.0 points per year required to meet the target. The slow progress is not due to a lack of government interest. National programs to address anemia have been around for half a century. Recently, under the National Nutrition Mission, the Ministry of Health and Family welfare launched Anemia Mukt Bharat (Anemia free India). In the context of current policy, it is imperative to understand which factors have been responsible for the biggest anemia reductions so far and to strengthen investments targeting those factors. Our findings suggest that the optimal anemia reduction strategy would take a holistic, nutrition-sensitive approach that targets underlying factors such as hygiene, family planning and healthy diets. Below, we highlight a few research priorities and policy implications that stem from our findings. Research priorities: First, given that making villages open defecation-free is one of the cornerstones of the Prime Minister’s flagship program (the Swachh Bharat Abhiyan), more rigorous research is needed on the program’s impact and the challenges involved in implementation and behavior change. Second, our study notes that the Indian population is likely not consuming enough iron due to its dependence on cereals as a primary source. Our rough estimate is that households are meeting approximately 60 percent of the recommended intake. However, data on nutrient intake at the individual level is scarce in India — health and consumer expenditure surveys do not capture this information. The collection of large scale data on the dietary intake among individuals should be an important area for future research. Policy implications: First, invest in the promotion of cereal fortification through popular consumption outlets. For example, biofortified or fortified rice and wheat can be distributed through the Public Distribution System, Midday Meal Scheme and Integrated Child Development Services. Second, continue to invest in women’s education as it is a key driver of several determinants of anemia and other nutritional outcomes. To request the research article or for further questions about this research, please email IFPRI-POSHAN@cgiar.org stating “Request for PHN paper on anemia” in the subject line. The post first appeared on the POSHAN website. How Can Improving Farmer Safety Help Improve Nutrition? Mounting evidence indicates that poor water, sanitation and hygiene (WASH) practices contribute significantly to stunting. In this post, see why although the connections among water, agriculture and nutrition might not be as easy to see, they’re every bit as important.